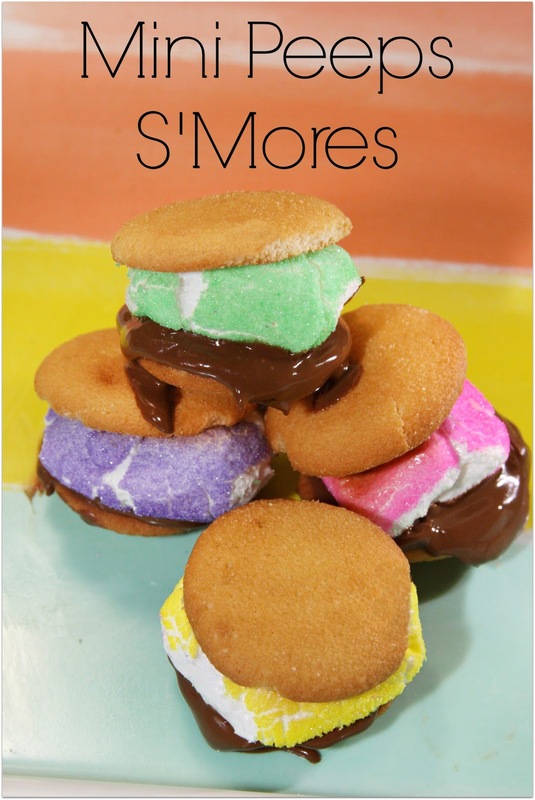 These bite size S'Mores are fun to make and eat and are made with only 3 ingredients! I actually made these on a whim this week to use up leftover Peeps after I made my Peeps Rice Crispie Treats. I didn't have graham crackers so I decided to make Mini S'Mores with vanilla wafers. I love the mini size and the colorful gooey marshmallow in these fun treats! My sweet Stella loved her messy but good Peeps S'mores! Break chocolate bars in pieces. You will need 8. Spread out 8 vanilla wafers on a lined baking sheet. Top each with a piece of chocolate. Cut each Peep in half, widthwise. Place a Peep half on top of each chocolate piece. Place pan under the broiler, in the center of the oven, for 1-2 minutes. Watch closely so they do not burn. Remove from oven and top each Peeps S'More with another vanilla wafer. Serve warm with extra napkins. All you need for these fast and easy treats are Peeps, vanilla wafers, and chocolate! Place pan under the broiler, in the center of the oven, for 1-2 minutes. Watch closely so they do not burn. Serve warm with extra napkins. Enjoy! Mac and Cheese Recipes You Have To Try! Mayo Taste Test for April Fool's Day!